Our FAVORITE peach dessert! 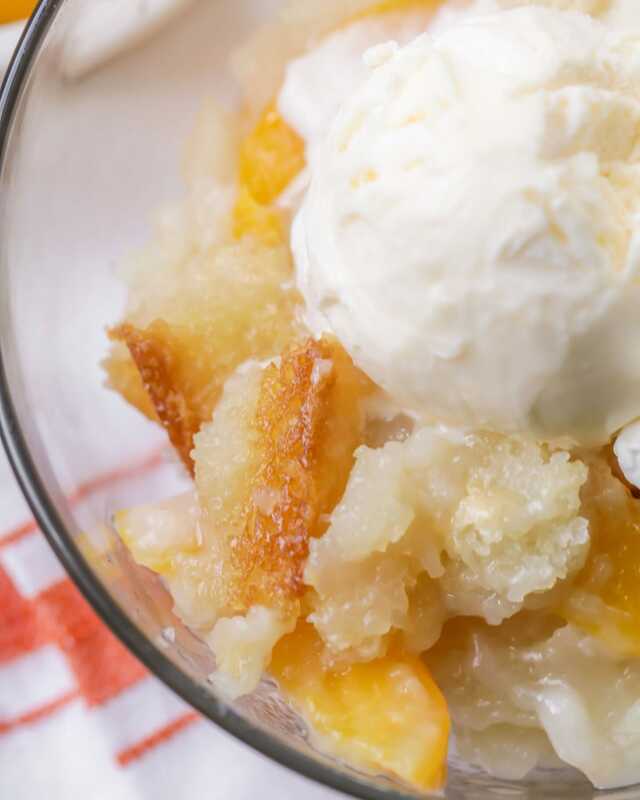 This homemade Peach Cobbler recipe takes just a few minutes to prep and is beyond easy! Add some ice cream and cool whip to this delicious cobbler and you’re set! I haven’t always loved fruity desserts (I’m more of a chocolate girl), but have fallen in love with them. From Fruit Pizza to Strawberry Shortcake to Cobbler – they have become favorites, and I can’t get enough of them. Today, we wanted to share with you our favorite homemade peach cobbler recipe that takes just a few minutes to prep and is beyond simple! 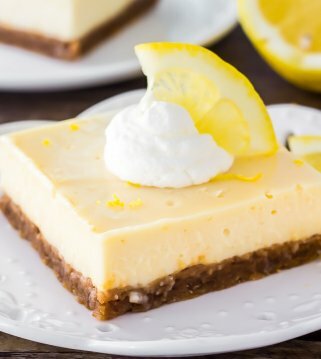 Let me tell you – this recipe is AMAZING!! 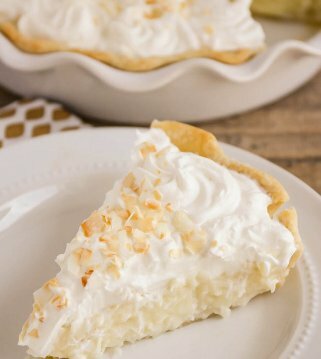 In fact, it’s become one of my favorite desserts to serve last minute because we always have the ingredients on hand, and it’s easy to double for a larger crowd. 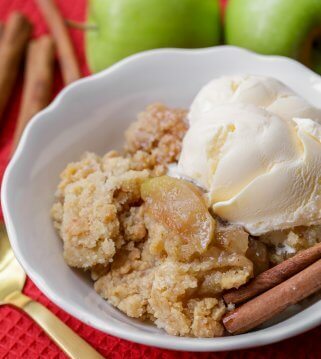 Serve it warm in bowl filled with vanilla ice cream (or even just whipped cream)and you are sure to get RAVE reviews every time you make it. 😉 I have yet to meet one person who doesn’t like this peach cobbler, so be sure to give it a go and let us know what you think. It’s so bread-y and butter-y it’s hard not to fall in love with this warm and delicious recipe!! Preheat your oven to 350° and melt the butter in a 9×9 pan in your oven. In a medium bowl, mix the flour, sugar, milk, baking powder, and salt really well. Take the pan out of the oven once the butter is melted and pour the batter mixture over it. Then, pour the can of peaches (with the juice) over it. Do NOT mix!! Bake for 30-35 minutes and serve warm. We love to serve it with vanilla ice cream and whipped cream! It seriously is the best and easiest cobbler that is so bread-y and gooey! I personally like to use canned peaches, because I think they taste just as good, and it saves me SO much time by not having to do any slicing. But if you prefer your peaches to be fresh, it is definitely possible with this recipe! 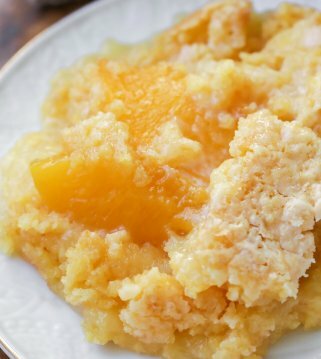 The only change you’ll make to the recipe is substituting the canned peaches with a boiled fresh peach mixture. Take 2 cups of freshly sliced peaches, 1 cup of sugar, and 1 Tablespoon of lemon juice, and bring to a boil over high heat. Pour over batter in the 8×8 pan. Do not mix! The rest of the recipe remains exactly the same. 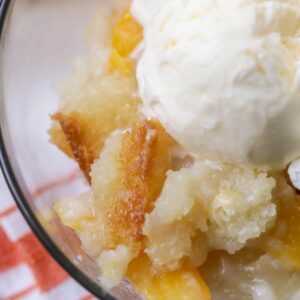 How to store and reheat peach Cobbler? To store cobbler, place in an air-tight container and place in the fridge for 4-5 days. We love having peach cobbler warm. To reheat the cobbler, use the microwave and reheat in 30 second increments. If you want to reheat in the stove, just bake at 350 for about 20 minutes or until heated through. Oh, man – this is my favorite. And it seriously only takes 5 minutes to throw together!! That is probably why I always like to have the ingredients plus a tub of vanilla ice cream on hand!! 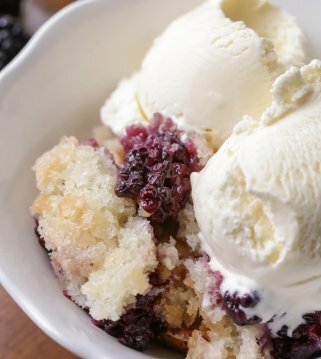 For another delicious cobbler, try our Blackberry Cobbler! Our FAVORITE peach dessert! 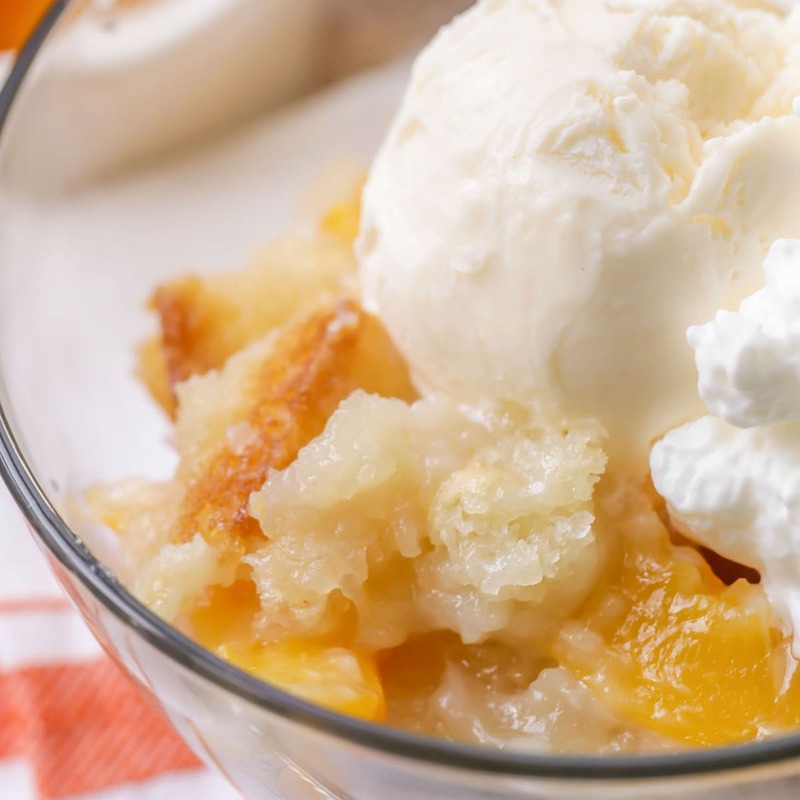 This homemade Peach Cobbler recipe takes just a few minutes to prep and is beyond easy! Add some ice cream and cool whip to this delicious cobbler and you're set! Melt cube of butter in 9x9 pan in oven. In a medium bowl, mix flour, sugar, milk, baking powder and salt. Mix well. Take out the pan with the melted butter and pour batter mixture over it. Also pour can of peaches (with the juice) over it. Do not mix. 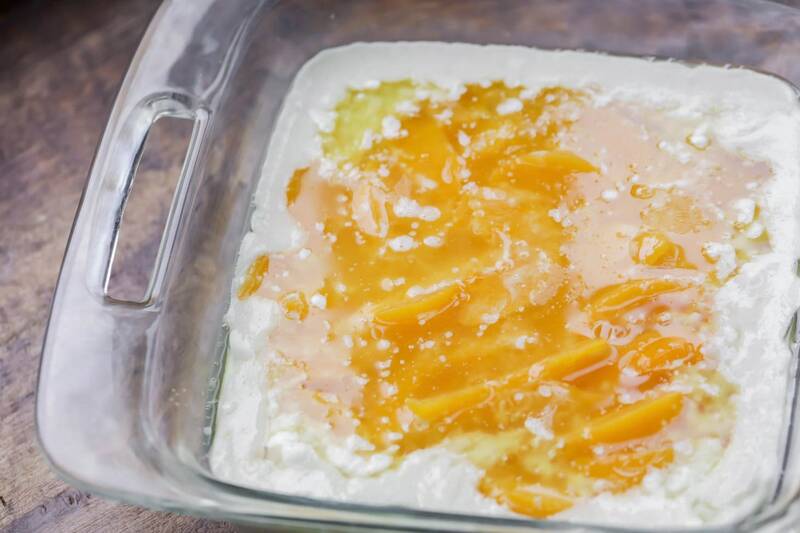 Substitute the canned peaches in step 4 with this boiled peach mixture. Take 2 cups of freshly sliced peaches, 1 cup of sugar, and 1 Tablespoon of lemon juice, and bring to a boil over high heat. Pour over the batter in the 8x8 pan and do not mix. I am totally the same way. I'm not a fan of fruit in desserts, and rarely care for any type of pie that doesn't involve chocolate. Peach cobbler might be a go, though; I LOVE peaches! Thanks so much for posting that great coupon for the children's museum! I had no idea! We'll definitely be doing that before it ends! Use All-purpose if you follow the recipe b/c you’ll be adding the baking powder and salt. If you use self rising flour, omit the baking powder and salt because self-rising flour already has that in it. Thanks for the Children's Museum deal! We are totally going this week! Looks great, but do you drain the peaches or add the liquid as well? Yes that what I do and it also says to do that In the instructions. I have seen that Divine Comedy video before and I totally LOL every time! Yup, it's the same at BYU-I, too. I love peach cobbler! It is one of my favorite summer recipes. I am definitely going to try this! xo MegganPS – I am having an Anthropologie giveaway this week that I think you would like! Woohoo, thanks for the museum passes and I have that same peach cobbler recipe – so good!!!! Just to let you know, I called the museum before heading over there, and this coupon was only intended for families already enrolled in the program, and the coupon went viral. I am so bummed! Thanks for sharing at Cast Party Wednesday. I hope you will join me again next week for another great party filled with amazing recipes! How many servings does this typically make? I am going to try this, but want to try it with the crockpot(due to heating up the house). Any suggestions? I’ll let you know what happens! I don’t see the recipe how do i get it ?? Hi. Thought I would make this during our Christmas festivities. Just curious if you use can peaches with heavy syrup or juice. For those that have diabetic husbands who love their sweets, I’ve tweaked the recipe. Canned peaches in juice, drained the juice and added ½ c. Splenda blend to the juice. Place the peaches on the batter then pour the juice over gently. Same with the batter, cut the sugar to ½ c. Splenda blend. Works like a charm! If you use self-rising flour you don’t need the baking powder, and I use a half a stick of butter when I make it. You can also make it with pretty much any combination of fruit or berries – fresh, frozen, or canned – and you can play with extracts and spices. I like a bit of cinnamon and nutmeg with peaches, almond extract with raspberries, lemon or cinnamon with blueberries, vanilla with strawberries. I am thinking of making this but I was wondering if you have ever replaced the flour with Bisquick? It was so yummy with Bisquick – I think I will add a little cinnamon next time! Thanks for the recipe! I did add a little extra Bisquick to it though. This was my first time making cobbler and it turned out great! I’m SO glad!! It’s definitely my favorite cobbler recipe because it is so yummy and is SO easy. 🙂 Thanks for stopping by! Good to know 🙂 Glad you liked it!! Thank you! I melted the 1/2 cup of butter in oven and followed directions. The butter looks like alot. After I baked it, in the end it looks like soup. Is it supposed to be like that? It does look soupy, once everything is poured in, but in the end, after it bakes, it will be just fine. Did it turn out ok? I hope so!! Yes I thought it was a lot of butter too and mine came out so soupy after it came out of the oven. The first time I did this I cut down on the butter and the sugar and it came out perfect. If i use fresh peaches do i need to add any juice to make up for what’s in the canned peaches? You probably would need to. I personally haven’t tried using fresh peaches. I’m not sure what would be the best juice to add? A peach juice or just water?? No need to add juice. If your peaches are fresh and juicy no need to add juice. What kind of flour is used? Self rising or all purpose? This was just luscious! And so easy to make. I did cut up my peach slices to ensure a good distribution of peaches throughout the pan. It was superb with both vanilla bean ice cream and real whipped cream. I tested both in the name of science. You are welcome. 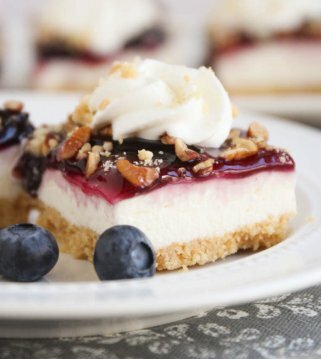 This will make a great last-minute dessert for company! So, happy you liked it!! It is great for company! Thank you so much for letting me know! WOW!!! This Peach Cobbler is simply DELICIOUS. My husband LOVED it and asked when would I make it again. Thank you so much for making dessert so easy. That’s a good sign 🙂 I’m so glad! Thank you so much for letting me know! My Grandma made great cobblers, so early on I was hooked. But then again everything she cooked was delicious. I would and y her side in the kitchen watch in awe! She did sprinkle a light poor of nutmeg or cinnamon on top of peaches. I am amazed you even have time to cook with 6 kids. I raised 4 it does force ya to be somewhat organized!???? Hello Lil luna, this pastime year my wife of 36 years , fell sick to manners disease . So cooking meals and desserts has been left to my prowess in the kitchen. May I say scrambled eggs was my claim to fame. I have been teaching myself coozing with the help of sites as yours. I look forward to preparing wonderfully dishes for my wife with the help of your wonderfully recipes. Love your easy recipes. Thank you for helping a lost in the kitchen guy.. Awe, you are so nice! I am sorry about your wife. You are awesome for taking great care of her. I am here to help 🙂 I am glad you stop by & find some recipes to try! I am definitely trying this? Yay!! I hope you like it! I’ve been making this cobbler for over 50 years of my marriage. My mother make it before me. I would never, ever use can peaches! Only fresh peaches go into my cobblers. Some think there is no difference. Trust me, close your eyes when you taste your first spoonful you will never go can peaches again. Other wise you will love, love, love this recipe. WARNING: Under no circumstances add cinnamon. For some reason people always want to add this fabulous spice to Peach Cobbler. Don’t spoil the recipe leave the cinnamon in the spice cabinet this time. This is amazing! One of the best cobblers I’ve ever had. You are so sweet!! Thank you for sharing! I made with canned Apricots. Ohhh so good. Perfect!! Thank you for sharing!! Glad you liked it! I gave this a try, made a few changes. Added a bit of vanilla, and a touch of cinnamon. It was delicious and a hit with the family. Next time will try to reduce the sugar, might have been a little too sweet. Wondered how if it’d work with canned pie filling like apple or blueberry. Would probably need more liquid, have to give that a little more thought. Thanks for sharing what you did. I have not tried it with other fillings, but I bet that would be good. I haven’t tried frozen, just canned or fresh, but you should be able to. I would let them thaw out first. Hi di you cover the peach cobbler before you put it in the oven? Nope 🙂 I hope you like it as much as we do! Wow! So pretty and no doubt fabulously delicious 🙂 Can’t wait for peach season! Thank you so much!!! Aren’t peaches so good?! Hope you try this!! I hope you do try some recipes 🙂 I’d love to know what you think! If I double this recipe do I use the juice of both cans of peaches? Yes & use a 9×13 🙂 Enjoy!! How long did you bake the doubled recipe? Usually, in a larger pan, the cooking time is shorter, but since it is doubled, it may be close to the same. I would just time it for 30 min then add a minute at a time from there, if it needs it. If your oven gets super hot, like mine, you could even check it at like 25 minutes. I found your recipe for this homemade peach cobbler and I’m so excited to try it! I Am cooking it as I sit here. 16 minutes left!! That makes me so happy to hear!! I am glad you found it, too! Thank you for letting me know & I hope you like it! This is a good recipe. But I have to disagree with you that canned peaches taste just as good as fresh. Usually when I look up a recipe like this I am doing it because I have fresh fruit off of my trees I need to use it up before it spoils. So of course I’m going to use fresh peaches. Peeling may be a pain but it makes could use the peaches in the fresh ones taste a lot better! I cook all of the time, great simple recipe! Awe, thank you so much!! I am happy to hear that you like it!! This recipe is great! Just made it and my family l❤ved it! Thank you! I am happy to hear they loved it!! Thank you for letting me know! I love ur site Mrs Luna !!!!! And i love ur happy smile & attitude towards ur honey & kids & super awesome life!!! Thanks for helping me feed my 2 Boys my husband & my son!!!! I love ur recipes & your awesome positivity!!!! Keep smiling & thanks for all u do. 🙂 many blessings to you & your fam. You are so sweet!! Thank you so much for your encouragement! I am so glad you like the recipes you try 🙂 Thanks again! Few questions to confirm. Do I peel the peaches? Does it matter if the peaches are hot? Does it come out more wet or crispy? And is your time based on a metal pan or glass dish? I like to use canned peaches for convenience, but if you are using fresh, yes, I would peel them. No, they don’t need to be hot 🙂 I use glass pans & it comes out more wet, than crispy. It’s perfect! My wife and I argue which peach cobbler is the best. I like more cake, and this is EXACTLY how I like it! Super easy to prep, and cook at the same time while everyone is enjoying a meal. I am so glad you thought so!! Thank you! Thank you for helping me score major husband points with this recipe. He is IN LOVE with this Peach Cobbler. I will for sure be making this often!! You are so welcome!! I am glad I could help 🙂 Thank you for letting me know! I’m a sucker for a good cobbler. Thanks for adding the instructions on how to use fresh peaches. It turned out delicious. Made this with some fresh peaches from s neighbor’s tree…sooooo yummy!!!! Another hit out of the park! Perfect!! Fresh peaches would be so good! Thank you! Wow, this was so easy to make & so tasty! We love peaches at our house, so of course this was gone so fast! This is an easy dessert for company or to take to a potluck or party. It’s the best & easiest way 🙂 Thank you! I bet you could make this cobbler with Cherries, blueberry’s or just about any fruit or berry that you wanted to. It would make a great Razzleberry cobbler. I like making Razzleberry Pies at the holidays but I bet it would be great to make it as a cobbler. I make a peach cobbler similar to this but i add cinnamon and substitue about 1/4 of the sugar with brown sugar. My questions is Why do we not mix the butter with other ingredients? VirTually every recEipe fot peach cobbler says not to mix them. Why? How can you fix peach cobbler with frozen peaches?? Good question..I haven’t tried. You need the juice from the canned peaches or the fresh peach option in the blog post. With frozen peaches, there isn’t juice, so maybe doing them the way you would with the fresh peaches (it’s in the post). Hi, what kind of milk do you use? Please UNSCRIBE me. I cant find THe Button otherwise I would do it myself. Thank you. krystyn, we LOVED IT !! I will have been married for 50 yrs this august and This is the first time i have ever had peach cobbler. I made it tonight and my husband and i just loved it. thank you!! poor guy. he said he’s had it before in the army. he just never asked me for it before. Now I know how good and how easy it is i will be making it more often. LOL!! Well, I am glad you could finally try it & make it 🙂 Glad you both like it!! Thank you! Will b trying next week, seems delish! It really is! I sure hope you love it, as much as we do! Thank you! Yay!! Glad it is!! I’m with ya..I try to stock up! Hi, you said you used canned peaches in juice. I found only canned peaches in heavy syrup. If I use them, would I have to cut down on the Sugar? I think juice isn’t as sweet as Syrup. Thank you for a fast and simple dessert. I hope mine will turn out Excellent! I mean syrup as well 🙂 That is perfect!